Little’s known about Khi Mee. In old paintings, Khi Mee has yellowish dog like body with thick neck fur and a bushy tail. There are, howver, many different types of Khi Mee. Hence they look different from the painted version on this page. Omnivorous in nature, Khimee belongs to Canine group of animal. Most of these animals hunt alone, but some catch their food in pack. Khi Mee has keen sense of smell and strong legs built for hunting. The main diets for Khi Mee are smaller animals such as squirrels, rabbits, etc. When sick, a Khi Mee has a way to heal himself by eating grass much like modern day dogs. Birds are probaly the most diverse creatures in the Himmapan forest. There are about 28 different types of birds roaming the land of Himmapan. Each with is own unique physical appearance. Some birds are highly respected for Hindus such as Garuda, the king of birds. Some, like Thepp Puksee & Thep Kinnanorn, are believed to be holy spirits. In the epic tale of Ramayana (Ramakien) alone, there are quite a few number of birds that play important roles such as Sadayu (pictured above) who served and aided prince Rama in the battle againt the giant race. In this section you will see different types of สัตว์ประเภทนก in the magical land of Himmapan. 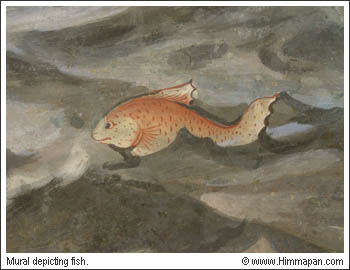 Most of marine creatures in Himmapan world are combination of a land animal and fish. Perhaps because in ancient time, people associate water with fish. Hence, everything that's able to swim would have fish tail. Some say Naga and Dragon are from the same root, crocodile. In some Chinese depictions of dragons, artists would draw the faces like those of crocodile's. Only newer Chinese dragons would have more of lion features for a dragon's head. Crocodile is one of the creatures that truly exist in real world. 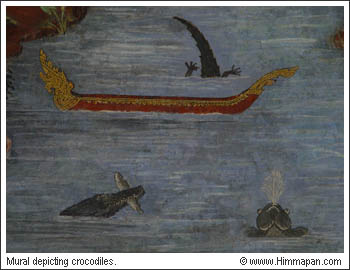 The main Thai literature that mentioned this creature extensively is Krai Thong the crocodile hunter. In this story, crocodiles have more than physical power, they are able to transform themselves as human beings and have many other magical powers. The main story is about relationship between crocodiles and humans from the conflict between teh 2 species, the hatred, and the love. Another country which has a lot of Crododile's tales is Egypt because the country's main river, Nile, is infesdted with crocodiles. 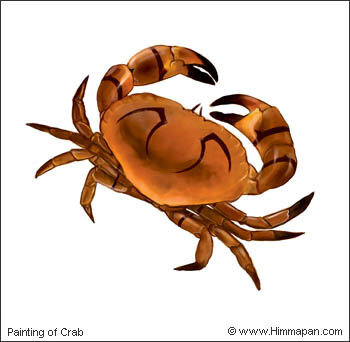 Crab is another creature that got mentioned quite often in tales and stories espeically ones that related to Lord Buddha. Perhaps, due to its already strange features; hard shell, big clumsy claws, and multiple legs, the creature's often not changed from its real physical form. In fact, in most legends, they are simply larger ones. Buddha was once born as a great elephant living in Himmapan forest near a pond. This pond's called "Nong Pu" or Crab Pond because the pond is dwelled by a giant crab. This immense crab would slay and eat elephants that come in to the pond for a bath. The great elephant eventually defeat the crab by stumping onto the crab's hard shell. Only the 2 large claws of the crab remain. These 2 claws were floated from this pond. One of the claw was sent to a king which he made a long drum out of it. The other one was picked up by the race of giant which they used to create a large war drum. Many years pasted, the giants lost the long war against lord Indra. Lord Indra took this drum away from the giants and kept in the heaven called "Dow Dueng". From this legend, it's believed that the tremorous sound from thunder's the result of this war drum.